Dr. Zafir Shehravi has obtained his MBBS from NHL Medical College, Gujarat, India and obtained his MS (Ortho) from KM School of PG Medicine and Research, Gujarat University, India in 2008. He also has a number of research papers and publications to his credit. Dr. Shehravi keeps himself updated in his chosen field by attending conferences and workshops, both local and international. Dr. Zafir has more than 7 years of experience in the field of Orthopaedics. He did private practice and was also a Consultant Orthopaedic Surgeon for 5 years in one of India's health institutions before moving to the UAE. He was also an Assistant Professor, teaching post – graduate and under graduate students prior to moving to the UAE. 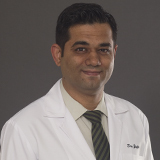 Dr. Zafir practices Orthopaedics and specialises in Trauma Management, Arthroplasty, and General Orthopaedics. His special area of interest include Complex Trauma Management, including Mal - Union, Non - Union, Treatment of Bone Infections, Knee and Hip Joint Replacement. Dr. Shehravi can communicate fluently in English, Hindi, Urdu and Gujarati.